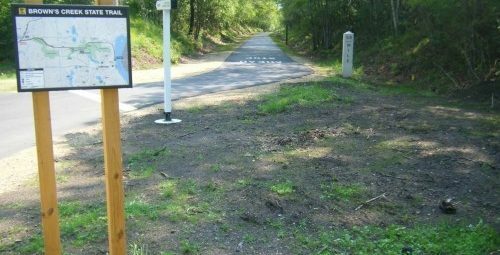 Archive by Category "Gateway-Brown’s Creek Trail Association"
Saturday, June 6 from 9am - 1pm is the grand opening of the Brown's Creek State Trail. The celebration will include five naturalist stations along the trail with activities to learn about the natural resources. The ribbon cutting will begin at 10am at the Stillwater trailhead and will include speaches, kids activities and music. The 200 members of the Gateway-Brown’s Creek Trail Association make up one of the most active Friends groups in the state, for good reason: The trail itself is the most heavily used trail in Minnesota. “We have volunteers that do everything from cleaning up the trail to lobbying for our share of bonding money with the Parks & Trails Council of Minnesota,” said John Oldendorf, president of the trail association and a board member of the Parks & Trails Council. This association has worked hard to expand the trail. They credit their success with expansion to getting to know people and communities along the potential trail.